A study on breast cancer conducted at IRB Barcelona identifies the key role of p38 in safeguarding tumour cells against the excessive accumulation of DNA damage, which would otherwise cause cell death. 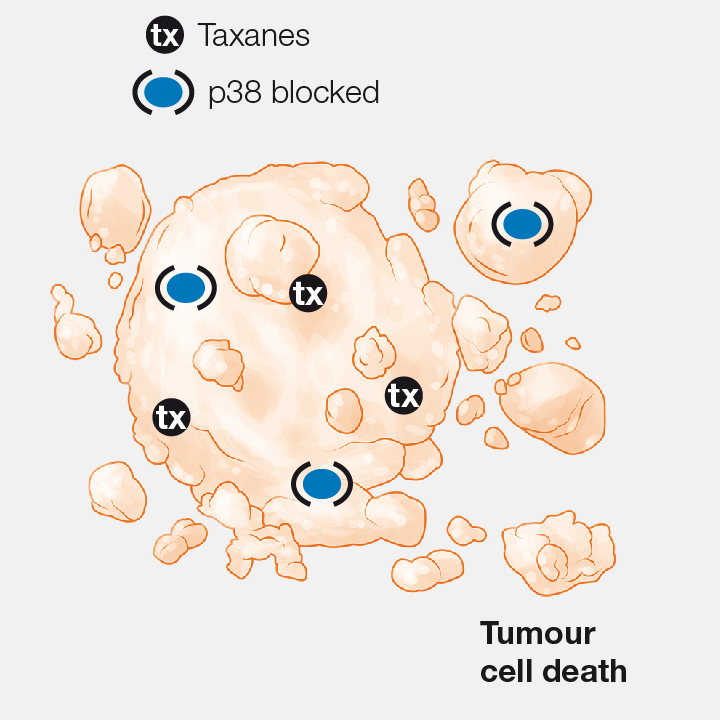 p38 blockage has been shown to increase the death of tumour cells, thus causing tumours to shrink. 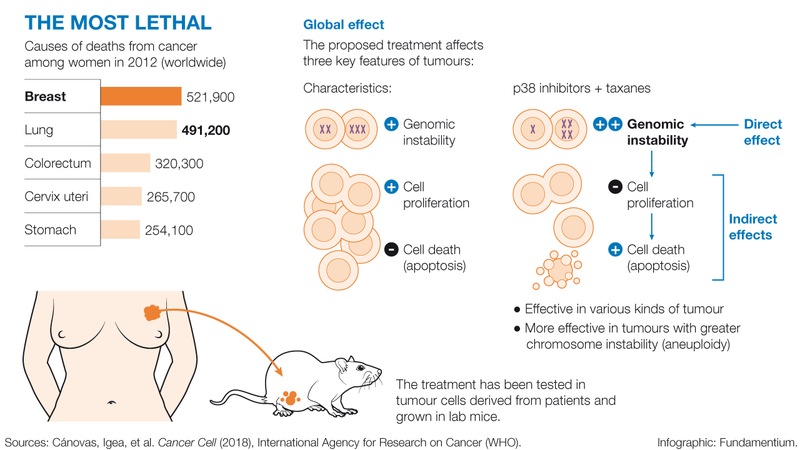 The combination of p38 inhibitors with chemotherapeutic drugs (taxanes) strengthens, accelerates or prolongs the antitumour effect in patient-derived tumours grown in mice. 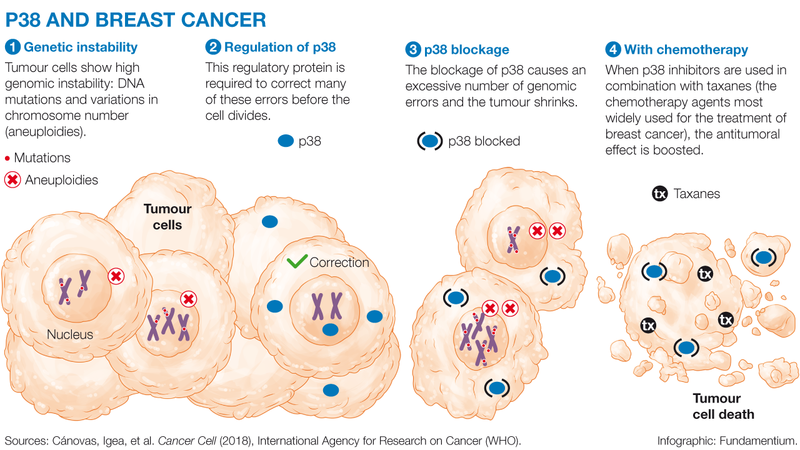 The results demonstrate that the p38alpha (p38 from now on) protein protects tumour cells by turning on a DNA repair mechanism. In this regard, p38 safeguards tumour cells against the excessive accumulation of DNA errors, or mutations. “Tumour cells inherently tend to accumulate DNA damage but in some this accumulation is greater, and we have observed that these cells are more dependent on p38 activity,” explains Nebreda. “Taxanes prevent cell division by damaging chromosomes and causing chromosome instability. As suspected, given that p38 hinders this action, if we switch off the function of this protein in cells, they lose their protection and taxanes can be more effective,” explains Begoña Cánovas, “la Caixa” PhD student and first author or the study together with Ana Igea, postdoctoral fellow and current IRB Barcelona Alumnus at the University of Vigo. “From the point of view of applications, it is one of the most interesting findings of this study as there are straightforward methods to measure chromosomal instability in tumours. But our findings have to be confirmed in a greater number of tumours from patients,” says Nebreda. “We hope that these studies are done, either in collaboration with our group or in other labs, and, if the results are confirmed, that the pharmaceutical industry takes the lead in performing the trials to test the efficiency of the combined treatment in patients”, he adds. In addition to the ERC, this study was supported by the Ministry of Economy and Competitiveness of Spain, the Government of Catalonia and the BBVA Foundation. The work was done in collaboration with Roger Gomis, specialist in breast cancer, and Travis Stracker, specialist in genomic instability, both at IRB Barcelona; Eva Gonzalez-Suarez and Violeta Serra at IDIBELL and VHIO, respectively, in Barcelona; the University of Zurich, in Switzerland and the University of Austin, in the United States. The article published in the journal Cancer Cell by IRB Barcelona scientists identifies the function of the protein p38 in the development of breast cancer and proposes new therapeutic approaches. 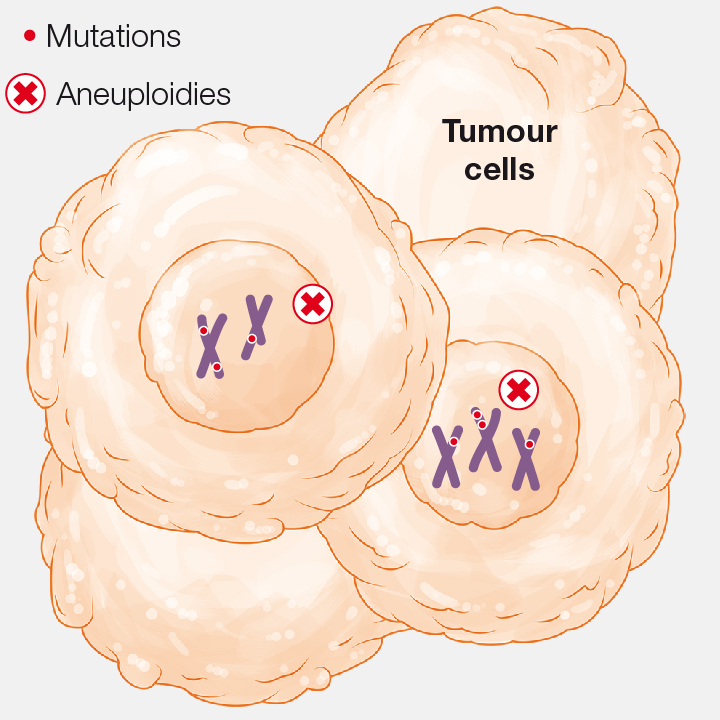 Tumour cells show high genomic instability: DNA mutations and variations in chromosome number (aneuploidies). 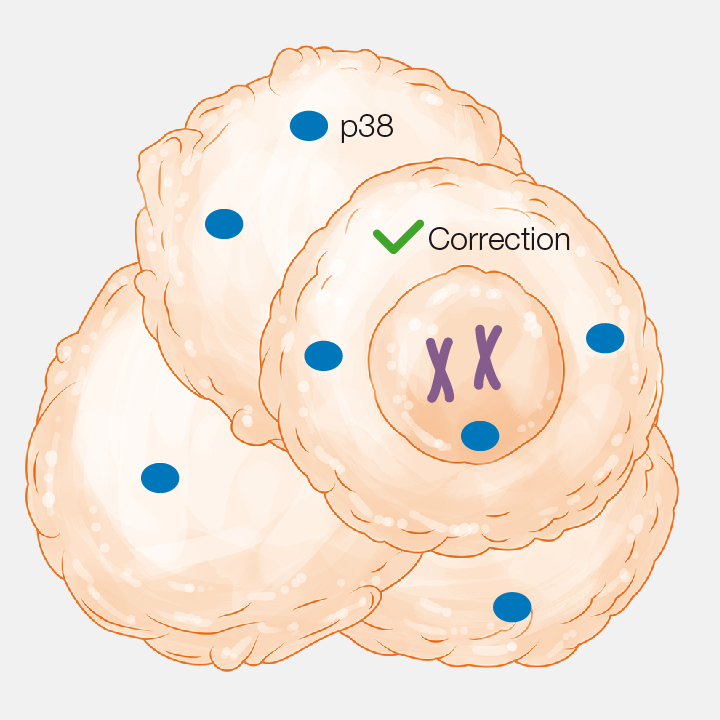 This regulatory protein is required to correct many of these errors before the cell divides. 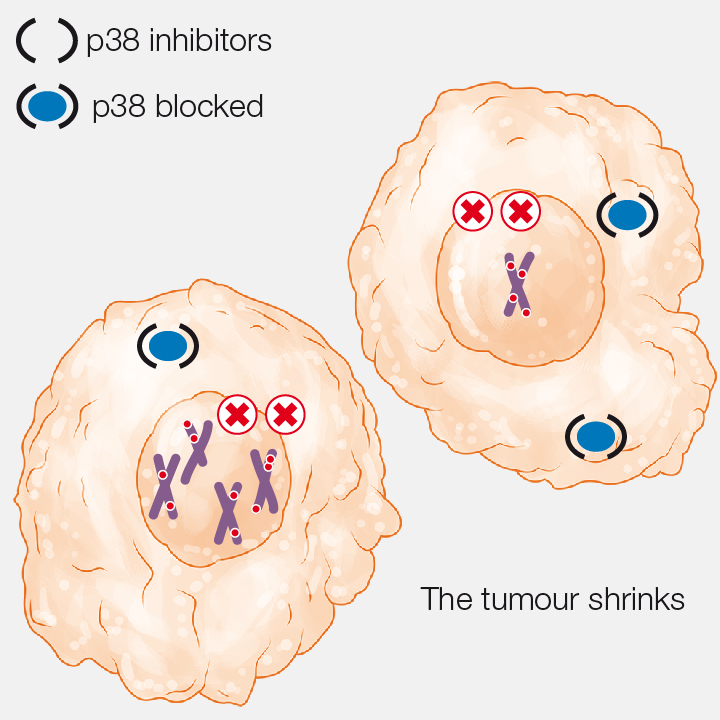 The blockage of p38 causes an excessive number of genomic errors and the tumour shrinks. 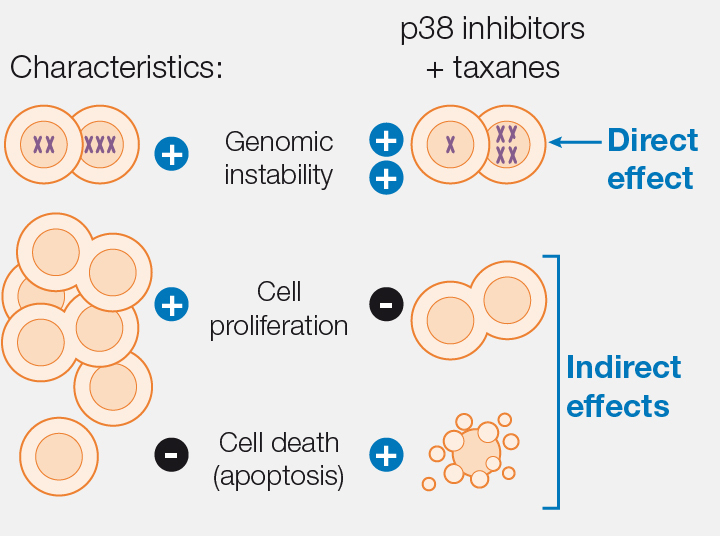 When p38 inhibitors are used in combination with taxanes (the chemotherapy agents most widely used for the treatment of breast cancer), the antitumoral effect is boosted. The treatment has been tested in tumour cells derived from patients and grown in lab mice. Sources: Cánovas, Igea, et al. 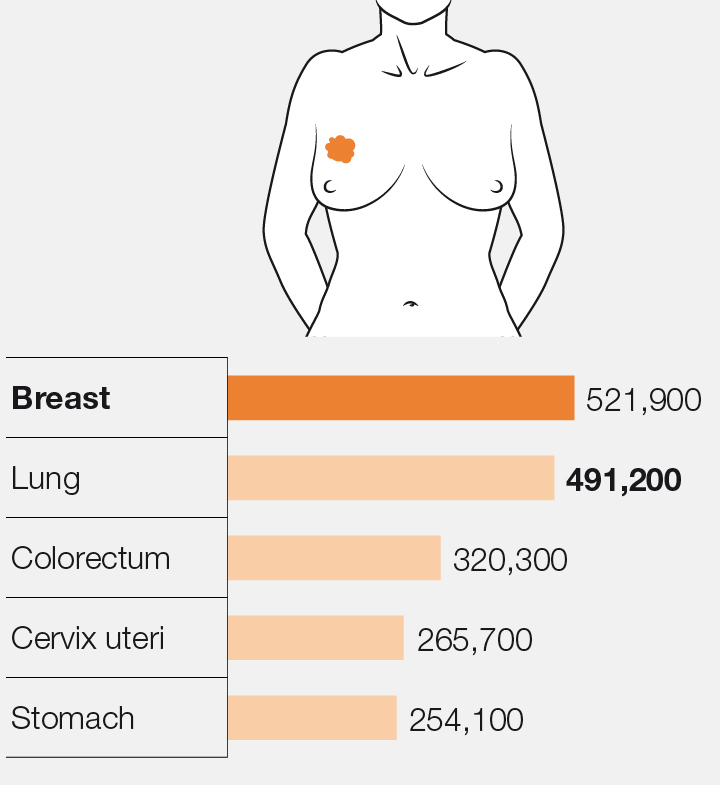 Cancer Cell (2018), International Agency for Research on Cancer (WHO).